Tuscany is famous for its food and wine, and there are literally dozens of fine restaurants, pizzerias and bars within easy reach of Ripertoli. There are traditional restaurants with hearty Tuscan fare such as Bistecca Fiorentina (a huge T-bone steak), modern ones with creative cuisine and inventive ingredients, pizzerias packed with locals, and everything in between. You can be sure of one thing – children will be far more welcome than in an equivalent English establishment! Here is a list of some of our favourites with our personal comments, which we hope you will find helpful. If you eat somewhere good which we don’t mention, please email us and we’ll add it to the list with you as the recommender. Our all-time favourite is the Ristoro di Lamole (www.ristorodilamole.it). It’s about a half-hour drive away, at the same height as Ripertoli but on the opposite (south-east) side of the Greve valley; you can go either via Greve (tarmac roads) or Panzano (dirt roads). The owners are Filippo (front of house, speaks excellent English) and Paolo. The food (modern Italian), wine and presentation are very good, the view is wonderful, and Filippo is a superb host and knowledgeable sommelier. Tell him you are staying at Ripertoli – it will be worth it. 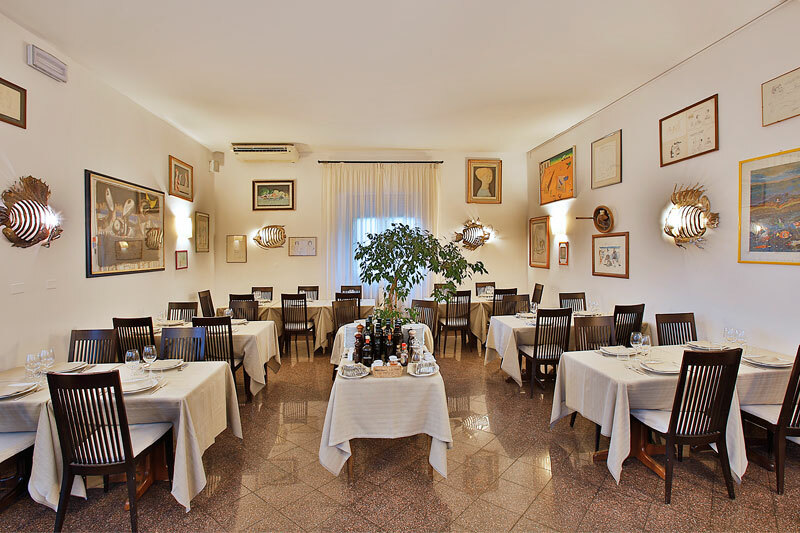 The Cantinetta di Rignana (www.lacantinettadirignana.it) is a traditional Tuscan restaurant specialising in hearty roasts and large helpings of pasta. It has a great view, serves its own wine, is very family-friendly, and is 10 minutes’ drive from Ripertoli. Turn left out of the drive towards Panzano and the right turn to Rignana is shortly after the left turn to Greve. There is an excellent modern Italian restaurant in the small boutique hotel Villa Bordoni (www.villabordoni.com). It’s actually about a kilometer east of Ripertoli as the crow flies, but easiest to find from Greve or by turning left to San Cresci (dirt road) before Montefioralle on the way down to Greve. Very international ambience (Scottish owners), lovely rooms (our olive farmer Roberto Ballini’s wife is head chambermaid and gave us a tour), and very friendly. Badia a Passignano (left out of the entrance drive, first right, and then a one-mile drive) has now got 3 restaurants, all very different and all good of their type. There is a very up-market restaurant Osteria di Passignano (www.osteriadipassignano.com) with an Antinori wine-shop attached. This restaurant has a Michelin rosette – one of very few in Tuscany, so we are privileged to have it on our door step. Another restaurant in the same village (La Scuderia) provides hearty meals with large portions of good local meat which may suit especially the young, though it is a bit overwhelming for us. The third is called La Cantinetta di Passignano (www.lacantinettadipassignano.it) and we would recommend it for modern Italian food, a lot of fish on the menu, a young helpful staff and rather eccentric décor. We had a delightful meal there in April 2012. In Panzano Mimmo and Arianna Baldi now run a wine shop and small restaurant called Enoteca Baldi in the centre of Panzano, in the square off the Via Chiantigiana. Mimmo is a world-class chef who tired of running a serious restaurant but loves running a friendly bustling local bar with a great atmosphere. Arianna & Mimmo speak excellent English & are dear friends of many years – their daughters used to work at London’s River Café – tell them you are staying at Ripertoli & you will get a special welcome. There are several restaurants in Panzano associated with the hugely popular and touristy business of Dario Cecchini. Since he is a butcher it is all about meat and that doesn’t suit us but there is a leaflet on the notice board if you are interested. If you like fish & shellfish, the Trattoria del Pesce in Bargino http://www.latrattoriadelpesce.it/ is superb. A local friend said to us “If a restaurant is on a main road with no view and is always full of locals, you can be sure the cooking is good” and he is absolutely right ! There are rarely any tourists, and the fish, shellfish and wine list are wonderful. It’s just past the big new Antinori winery on the SS2 beside the Firenze – Siena Raccordo. The background music is usually jazz – another plus. Two miles south of Panzano there is a right turn to La Piazza, (www.osteriaallapiazza.com) where there is another modern restaurant where you eat in the open air in summer. We had an excellent meal there in May 2012 and were struck by the good value, especially when it came to wine where the list of local wine was extensive and prices modest. Il Cavaliere at Castello di Gabbiano, (www.ilcavalieredigabbiano.it) is a local modern Italian restaurant set in the grounds of the wine making estate of Gabbiano. When we ate there in 2017 we found the food good and enjoyed their estate wine which is good value. In the beautiful hill village of Volpaia 10 miles south east of us near Radda, there is a family run restaurant with home made pasta under the direction of a fine old lady. It is called La Bottega. The view is great and the food hearty and traditional. We hardly ever eat in Greve itself, as the country restaurants have much better views and Greve has so many tourists that the restaurants have it relatively easy. 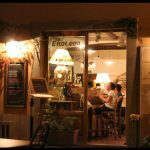 We would consider eating in the Enoteca Fuori Piazza – we had a nice meal there in January 2016 – the Bottega del Moro, and the Gallo Nero at the traffic lights by the entrance into the main piazza. The macchiato and ice cream in the Bar Lepanto in the main piazza are unbeatable – eat your heart out Starbucks! Il Pozzo at Monteriggioni (just north of Siena, www.ilpozzo.net) is a good traditional restaurant in an unusual walled town with lovely views. If you are visiting Siena it is worth a visit on the way home. Badia a Coltibuono just outside Gaiole, www.badia-a-coltibuono.com is a famous winery with another good traditional restaurant and a shop where you can buy their own wines, honey, and olive oil. Florence of course has many excellent restaurants. In summer we like lunch in Harry’s Bar (www.harrysbarfirenze.it), which is patronized equally by visitors and posh Florentines; the food is very good, as is the air-conditioning. Cantinetta Antinori is also very good. The debate over the best ice-cream parlour continues – we think Perche No (Why Not, www.percheno.firenze.it), just north of the Piazza Signoria, is best for fruit sorbets, and Vivoli (near Santa Croce, (www.vivoli.it) for creamy ices.